A couple of posts back, I ranted about the ongoing quest for the new in edtech at large conferences. Of course, on the other side of that quest are the many companies developing and marketing their products at events like BETT, FETC, and ISTE. Related to that, Audrey Watters is someone who does excellent work writing about the big money attempts to “reform” American education and the place of edtech in that process. In a recent essay, Fables of School Reform, she starts with this observation of the results of all that investment. Over the past five years, more than $13 billion in venture capital has been sunk into education technology startups. But in spite of all the money and political capital pouring into the sprawling ed-tech sector, there’s precious little evidence suggesting that its trademark innovations have done anything to improve teaching and learning. Extend that timeline back, say thirty years, almost the range in which I’ve been involved in the process of using technology for instruction, and consider all the money and time that’s been expended by schools, governments, and teachers. Can we say it has improved teaching and learning? A question, not a judgement. One deserving a much more extensive debate. Anyway, Audrey is excellent at following the threads of education reform through history and in this piece traces the efforts to bring computers into schools back to A National At Risk, the 1983 report that kicked off the modern panic about the American education system. As with so many of the studies that followed, the conclusions were based on test scores (the SAT in this case) and are “wrenched out of historical context”. She then brings the thread into modern day by visiting the ASU + GSV Summit, “a business of education conference fondly known as ‘Davos in the Desert’” (before moving from Phoenix to San Diego). The New York Times called it “The must-attend event for education technology investors”. This year featured speakers included such well-known education experts as former Mexican President Vicente Fox, former US president George W. Bush, and… Matthew McConaughey?1 Of course missing from the presenters (and likely the attendees)2 was anyone who could speak with actual experience to the process of teaching and learning. In addition to the conspicuous absence of education researchers from the “constituencies” served at Davos in the Desert, there was no mention of either students or parents. Indeed, every year (this year’s was its ninth), the ASU+GSV Summit seems to nearly coincide with AERA [American Educational Research Association], an organization that’s been around since the early 1910s. It’s hardly an insignificant scheduling gaffe. If nothing else, the dueling conference schedules tap into a powerful cultural trope, one that’s particularly resonant among Silicon Valley and education reform types: that education experts and expertise aren’t to be trusted, that research is less important than politics, that the “peer review” that matters isn’t the academic version, but rather the sort that drives a typical VC roadshow. There is much more to Audrey’s experience at the Summit and her observations of the edtech business in general. This post is well worth 20 minutes of your time to read it all. She is also someone you should follow. 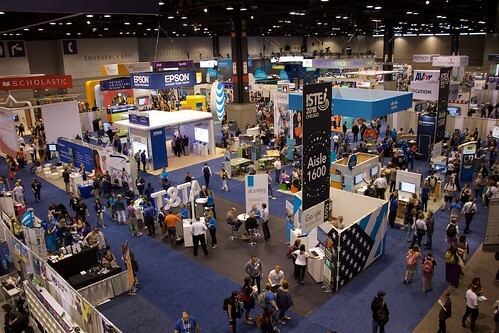 The photo shows just a part of the vast Expo floor at the ISTE conference last June in Chicago. ISTE also works very hard to promote the edtech startup business through their Edtech Startup Pavilion and annual Pitch Fest. 1. The speakers at the 2019 event in April include a mix of tech executives, politicians, and celebrities. It’s a very strange brew. 2. With ticket prices starting at $2800, I’m guessing not a lot of teachers attend this conference. Did you know your school and students are a potential cash cow? There are lots of edtech entrepreneurs, and the venture capitalists who finance them, who think they can make big profits in the “education sector”. A good deal of this activity is focused on the college level but a not insubstantial amount of money is also flowing into startups trying to create “disruptive innovations” for us in K12. Our education system is one of the last places to be remade by technology. Â That’s about to change. Â We are investing in the people, ideas and companies that are rethinking the way we learn and teach. Â Today. Rethink Education seeks to invest in progressive growth-stage companies that are at the forefront of the education technology industry and have the capacity to make positive impacts on our communities. Very nice. Except what if the system doesn’t want to be remade? What about the large number of educational institutions, probably the majority, that are very comfortable with their traditional processes and are most interested in technology for cost, management, and administrative savings? Even one of the VCs they quote, someone who has “named education as one of his key targets”, understands those questions. So, if the people with big bucks to invest in the education business sees hostility to change in public schools, why are they putting large amounts of money in this “sector”? The answer is that they aren’t really investing in public schools. Those edtech entrepreneurs are developing products – electronic textbooks, automated teaching systems, data collection/management systems, and more – for charters, private schools, for-profit colleges, and a variety of other education structures that will be subsidized in large part from public funds. And they’re counting on that area to grow quickly over the next decade or so. Their customers are not the people working directly with kids. They are selling to administrators, politicians, and chain school owners who think the process of educating children is very complex (which it is) and who are looking for ways to reduce that complexity, homogenize the results and spend less doing it. Those tech companies and their investors who are looking to “disrupt education”Â are gearing up to sell them the “solutions” to make it happen. And it is going to happen. Unless those of us who believe in public schools get to the disrupting first. We need to change ourselves, our institutions, before it’s done to us. We need to take a long look at every part of our traditional approach to educating kids and remake it to fit the fast changing, chaotic world in which they (really all of us) will live. We need to start the hard work of disrupting ourselves.